La Documentation française (DF) is a public service coordinated by the French government operating since 1945 with interministerial publishing and databank tasks for all public affairs topics. Having started with digitalization in the 70s, the DF website is now able to provide a huge amount of offical records, as well as publications, journal, reports and updated dossiers on the main French and international themes on politics, economics, administration, society and culture. The online catalogue consists till now in more than 10,000 records since 1993. Photo and map archives are also present and accessible for free. The website presents all DF publications, its activities and services, as well as those of related institutions and websites. An entire section is devoted to the public reports (7,500 among public institutions, authorities, courts, administrations dossiers) fully retrievable for free in pdf format by all users. All website sections are freely accessible and well organized so that material location is quite simple. Records and materials are fully and freely available according to their nature and topic, i.e. all dossiers, maps, multimedia interviews, and international notes. Others – mostly books and journals – are instead available only by purchase or subscription. The language used for the website as well as for all material is French. Who designed this site?? I mean “IPSAportal.net”?? Excellent idea, but I wonder whether the people who put this site together actually know what it’s like to have to use it?? Somehow, someone put too much emphasis on graphics and presentation and a lot less emphasis on consolidating all of the links on this website. When I say “consolidating” I’m really referring to an overview of all of the sites listed on IPSAportal.net and the weblinks. I mean all on a single webpage. 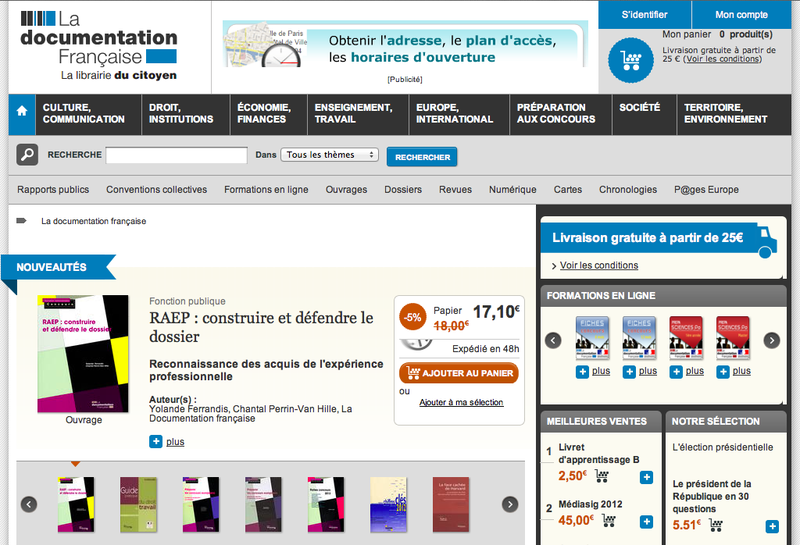 Because navigating from the homepage of IPSAportal.net and even through “quick search”, “La Documentation Francaise” is nowhere to be found. I can only access this specific webpage describing “La Documentation Francaise” through Yahoo. Since IPSAportal.net claims to have access to the top 300 political science websites a good idea would be to simply have a page that lists them all. The list could retain the categories that’ve already been designated or the 300 websites could be listed alphabetically. But all 300 need to be visible at a glance on a single page. Because as it stands IPSAportal claims to have access to 300 political science websites, but navigating the website is so uncoordinated that noone can quickly manouver through the website and actually count up 300 political science websites. Is a single page that lists all 300 political science websites, to include La Documentation Francaise, too much to ask for?? Listed and commented Websites are reviewed every six months. During this period we try to add and evaluate new websites. The process is not simple because the editorial board has a very serious policy evaluation. We choose to classify each website looking at type and the content of the source because Ipsaportal is a directory not a search engine. To us, it’s important to understand whats going on in each category having the possibility to compare a little bit among websites.